Growth form: Annual herb. Flowering. Feb–Mar. Status: Native. Local. First record: SW Qatar, March 2007 (John Norton & S. Aspinall). Miller & Cope mention a record for which there is no supporting specimen. Also recorded: E Saudi Arabia, UAE. 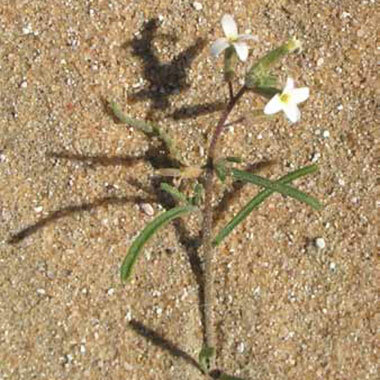 Habitat & distribution: Occasional, mainly on compact, gravelly soils in SW Qatar (found in 2007 at several scattered localities following winter rains). Elsewhere in the Gulf area it is a widespread plant of deeper sand, becoming locally abundant after rains. Gravel and sand forms have been noted by Collenette (see Miller & Cope).